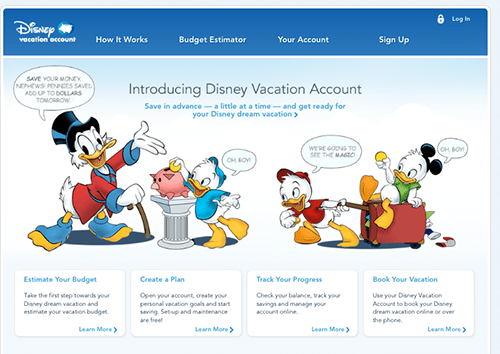 Disney recently announced the Disney Vacation Account. It’s neither a savings account or a layaway plan, but more of a hybrid of each. Disney Vacation Account is currently available to US Residents. You may add to the account via Disney gift card, debit card or credit card. Monthly payments can also be automatically deducted from these cards. But, payments to/from bank accounts are not accepted. The funds are FDIC insured through JPMorgan Chase Bank, however it is not considered a savings account. Funds can be applied to Disney resort reservations, tickets or Disney Cruise Line fares. A refund can also be requested at any time, which is applied back to the original form of payment. This means that if you add to your account with a Disney gift card, you need to save that card in the event your vacation is cancelled. Here’s the real benefit, you may receive a $20 Disney gift card for each $1000 that you spend on a Disney vacation. So after payment is sent to Disney, you may request a gift card. The gift cards also require 4-6 weeks for delivery. Different vacation packages have different due dates for final payment. Request the gift cards as soon as you make that final payment. But, there’s one more quirk, the money has to have been in the account for at least 120 days prior to payment to be eligible for gift cards. Money that is in the account, but not applied to a Disney vacation may be requested in the form of a Disney gift card. But, and this is a big but, there is a lifetime maximum of $500 in Disney gift cards. It can also be refunded to the original payment method. Travel agents may be utilized with Disney Vacation Account. However, payments must be applied directly to the reservation through Disney. It also appears that funds can be applied for tickets only, meaning you could potentially secure a hotel with rented DVC points, or at a non-Disney resort. Although you will want to verify this option. The Disney Vacation Account is not as flexible as a standard savings account. Unless credit cards are paid in full each month, interest charges may overshadow the potential 2% bonus. The $500 lifetime maximum on Disney gift cards. This may limit saved spending money for souvenirs or dining. The account locks you into purchasing direct from Disney rather than through a 3rd party, which may or may not enhance savings. The Disney Vacation Account may be great for those already interested in purchasing a full package with dining, tickets, resort, etc. Or those who want to sock away some out-of-sight money for a Disney vacation. For me, I’m a bit hesitant as I like the flexibility to purchase from a third party to save money if needed. The absolute best use I can think of for Disney Vacation Account is with Disney Cruise Line. There are no real third party discounts with Disney Cruise Line. The only additional discount available is with a travel agent’s onboard credit. The good news is that travel agents can be assigned with the use of Disney Vacation Account. Final payments are typically due 90 days in advance which allows plenty of time to request the gift cards. If you can allow your money to sit 120 days prior to payment, this might be a great way to add credit for your onboard spending.